Normally I’m opposed to adding anything sweet to orange vegetables. They start off pretty sweet as is, so savory preparations usually seem like the way to go. Also, I somehow managed to grow up sheltered from the travesty that is sweet potato-marshmallow casserole. But I digress. My point is that this recipe, despite the fact that it involves maple syrup, is not too sweet. 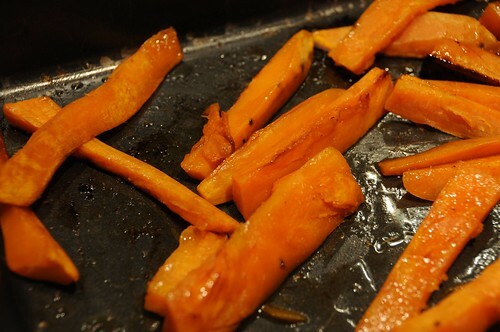 The syrup’s taste is nearly undetectable, but the sugar helps the potatoes caramelize to a nice crust. As a bonus, these are cooked at a high temperature, which means they don’t need hours in the oven to cook through. 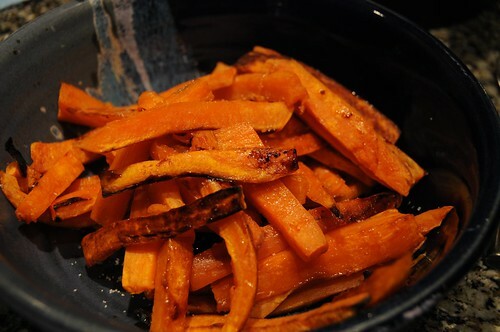 Peel the sweet potatoes and chop them in half the long way. Slice again the long way, and then cut any really tall pieces in half (still the long way!) to make shapes like fries. You can cut them in half to make matchsticks if they’re unreasonably long. (You can also use other shapes, of course, but you may need to adjust the cooking time; keeping the size of chunks uniform is the part that’s key here.) If it takes you as long as it took me to do all that chopping, keep the chopped pieces in a bowl of cold water so they don’t turn funky colors. Melt the butter in the microwave or a saucepan. Spread the pieces out in a single layer on a baking pan. If you aren’t morally opposed to non-stick cookware, it will make your cleanup a lot easier in this case. I used two 9×13 pans for my potatoes, mostly because I made long sticks. Pour the butter over the potatoes and stir to coat, then stick them in the oven for ten minutes. After ten minutes, the potatoes should be mostly cooked. Take them out of the oven and carefully pour the maple syrup over them, avoiding opportunities to burn yourself on the pan. (Do as I say, not as I do.) Use a spatula to turn and stir them, distributing the syrup as evenly as reasonably possible. Return them to the oven for another five or seven minutes, until they’re getting a bit crispy and are tender all the way through. (You can check this last with a toothpick.) Transfer to a serving dish and salt to taste. Those sound amazing! Now to figure out what the group here would eat with them.